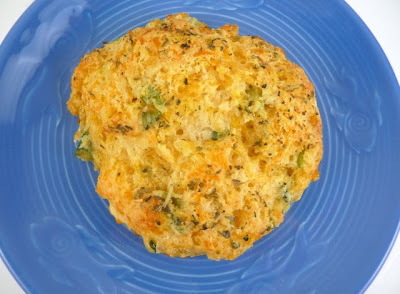 I was looking around for a copy-cat recipe for Red Lobster Cheddar bay biscuits - but I didn't want to use Bisquick. So this recipe was perfect - they were very easy to whip up and tasted great. I served them with my favorite chili-rubbed salmon and a veggie - and they were great. I froze the leftovers and I just ate one the other day - and it tasted as good as it did the day I made them. I don't know how similar they are to Red Lobster though - since I can't remember the last time I ate there - but I do know they make good biscuits! 2. Whisk together flour, baking powder, sugar, baking soda and salt, in a bowl, then blend in butter with your fingertips or a pastry blender until mixture resembles coarse meal. 3. Stir in Cheddar and scallions. 4. Add buttermilk and stir until just combined. 5. Drop dough in 6 equal mounds about 2 inches apart onto a baking sheet. 6. Bake in middle of oven until golden, 15 minutes. 7. While baking, combine the melted butter and Italian seasoning. Brush butter-herb mixture over hot biscuits once baked. I love Cheddar Biscuit. You just have to eat them right away! Unreal! These are fantastic. Thank you!